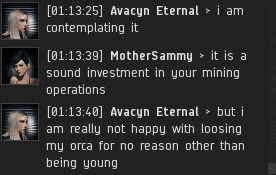 Previously, on MinerBumping... Rebel Orca pilot Avacyn Eternal lost her Orca as a penalty for bot-aspirancy. 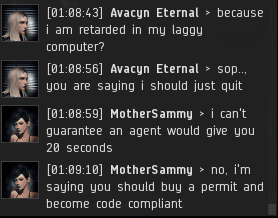 Agent MotherSammy reminded Avacyn of the importance of obeying the Code, but she replied with every excuse in the book. Avacyn threw up her hands at the suggestion that she might need to pay attention to local chat. She'd rather quit mining altogether. Something about having an Orca vaporized in highsec makes carebears go into "I'll just quit" mode. Quitting is the easy way out--the coward's way out. 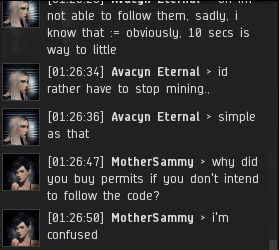 If you want to show the highsec community that you have the guts to play EVE, try following the Code. 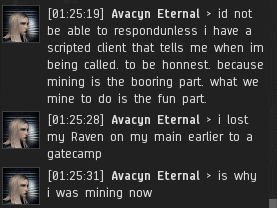 Avacyn began to seriously consider buying a mining permit. She threw out one more tacky "woe is me" shot about being the victim of age discrimination, but MotherSammy wisely ignored it. It was high time Avacyn learned to behave as an adult. MotherSammy kept the conversation on a more goal-oriented path. Avacyn wasn't yet finished feeling sorry for herself. But it didn't matter. Nothing in the Code says that a miner should wrap herself in self-pity. 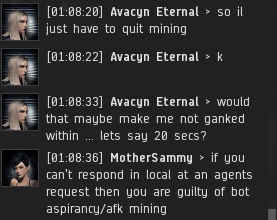 Some miners need to be brought to the breaking point before they can be remolded into a more appropriate EVE player. Avacyn was reaching that point now. Good things were about to happen. 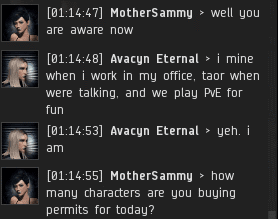 Avacyn decided to purchase two brand-new mining permits. MotherSammy congratulated her. It's a cause for celebration any time a carebear is able to put aside gluttony and greed by giving isk to the New Order. In order to receive the benefits of owning a permit, one must be able to present one's permit to the authorities. 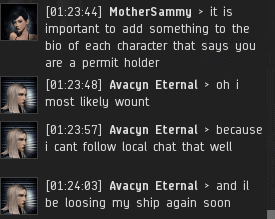 MotherSammy reminded Avacyn to put something in her bio to that effect. Avacyn's response amazed her. 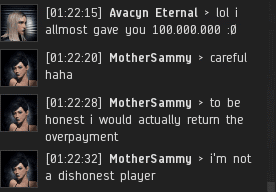 Incredibly, Avacyn had paid 20 million isk despite having no confidence whatsoever in her own ability to follow the Code. Avacyn was so busy wallowing in despair that she couldn't recognize how empowering the Code is. She should have been thrilled at the opportunity the Code gave her, but instead she was being a total downer. An Eeyore, if you will. This was a bad sign. There are a lot of Tiggers in the New Order, but no Eeyores. The Code is a test. It challenges miners to be their best selves. Avacyn transferred some isk, but she condemned herself to failure anyway. Lacking faith in herself, she gave up on the Code and didn't even put a pledge of loyalty to me in her bio. Avacyn's story may be a depressing one, but it's actually another victory for the New Order. Some miners won't even go to the trouble of giving us the money they owe. Avacyn at least took the first step. 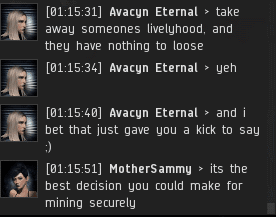 I'm confident that if she continues to lose ships, she'll summon the willpower and self-esteem necessary to make her become a proper miner in my perfect highsec. I'm not very confident. She says "I'd not be able to respond unless I have a scripted client that tells me when I'm being called." Pays for permit but won't display permit. It's like an elevator permit or retail certificate- must be displayed. Sadly she falls back into bot aspirant thinking. She wants a bot to follow the code. That sounds like she's falling further down the hole of bot aspirancy. or is/was straight up botting. I must agree, Erotica. The mention of scripting to alert Avacyn of agent presence alarmed me. Those that fall behind, get left behind... in clone vats. Now that this entire story has been published, I can finally blow the full transcript. May James have mercy on her soul.